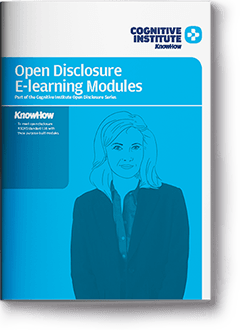 Module 1: Open Disclosure Principles is a short duration (20 to 25 minutes) E-learning module that provides an overview of open disclosure, outlining its importance and what it means for patients and clinicians. Module 2: Open Disclosure Conversation (45 to 60 minutes) is a highly interactive E-learning module designed to develop the understanding and skills required to support effective open disclosure. consultation with international subject matter experts and instructional design professionals. These interactive modules are developed by E-learning specialists based on Cognitive Institute’s expert subject matter. They are built using instructional and multimedia principles that maximise immediate and ongoing user engagement with content. Please use this form to register your interest and a member of our team will be in touch. Before registering, please ensure you have read and agree with the terms and conditions in the attachment. Additionally all materials are made available for personal use only and are subject to copyright. These short duration E-learning modules provide an overview of open disclosure, outlining its importance and what it means for patients and clinicians. They are designed to develop the understanding and skills required to support effective open disclosure. Users test and apply knowledge in response to a real-life scenario and video examples are used to illustrate and reinforce the skills and principles contained in the Open Disclosure Framework. They provide users with an introduction to the skills required for effective open disclosure conversations. 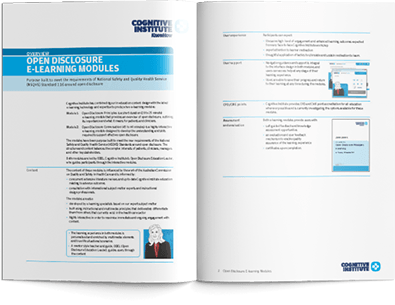 The E-learning modules offer handheld device functionality and are available to upload onto your organisation’s learning management system. An interactive mentor style teacher and guide, ODEL (Open Disclosure Education Leader), guides users through the content. Participants will be provided with a certificate on completion of each module. Users are provided with the same high level of engagement and enhanced learning outcomes expected from any face-to-face Cognitive Institute workshop. Navigation guidance and support is integral to the interface design in both modules, and users can access help at any stage of their learning experience. Users are able to save their progress and return to their learning at any time during the modules. The cost for both modules is $250 (including GST) per person. An invoice will be sent to you for payment and access is provided following receipt of payment. Access may take up to two business days. Please contact us to find out more about the costs to integrate this workshop for your team or within your organisation. Purpose built to meet the requirements of the National Safety and Quality Health Service (NSQHS) Standards 1.12 for open disclosure.